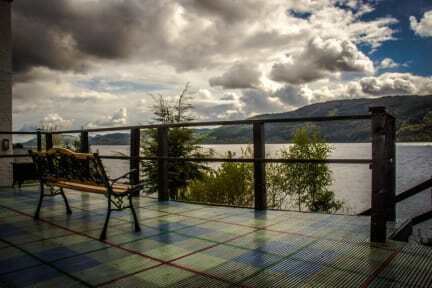 Perched on the banks of legendary Loch Ness, The Lochside Hostel offers totally unrivalled views of Scotland’s most famous Loch, and direct access to the water's edge! Perfect for walks, monster spotting and even a dip into the mysterious waters! As well as our unique location, and lovely facilities we are so easy to get to! All busses from Inverness, Skye and Fort William stop at our door. If you travel by car we make a great base to explore most of the Highlands - from Skye to Ullapool to Ben Nevis to Inverness to Aviemore and the rest - with a great lounge and extensive kitchen to return to in the evenings. We also have an alcohol license and food-to-cook for sale. Canoeists – a jaw-dropping expanse of water at your doorstep ! Reception shop selling food, snacks, sweeties, beer and wine. Check out before 10:30 [you can leave your luggage and use the facilities until later] . Reception: open 7 – 11am and 5 – 11pm. Guest under the age of 16 must be accompanied by an adult and stay in a private room and/or have all beds booked to themselves. Children will NOT be allowed to share a dorm room with other guests.